One of the most effective methods to get your message across to the world today is by using a social networking platform. Several tools are constantly being created to cater to users who wish to build and expand their social network. After all, the more followers you have the better your chances of being heard! And since not everybody is a Justin Bieber or Ashton Kutcher, we need such tools to help build our networking community! Today’s topic is about a cool new tool I’m trying out to increase followers on Pinterest. It’s called PinWoot and it is based on a pretty simple concept to help you find followers and build your Pinterest network. Before I get started, you must know that PinWoot is in its very early stages of development, and although I don’t review tools at such an early stage, I believe PinWoot has got great potential to grow into something big. Pretty simple concept really. Sign up for PinWoot. It’s free. Once you create an account, connect it to your Pinterest account. When you sign up you will receive 10 seeds. Follow users to earn more seeds. Invite friends and based on your recommendations, you’ll earn more seeds. On your dashboard, you’ll see other Pinterest users you can follow. 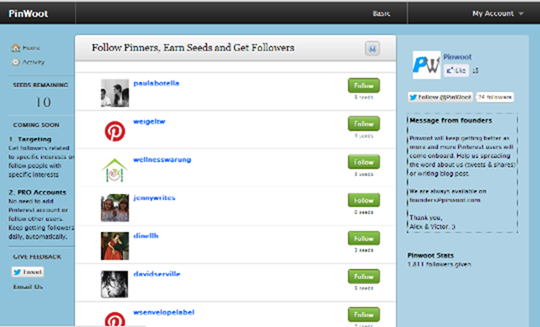 Simply click the Follow button to get more followers on Pinterest and start building your network. When other users follow you, you seeds will get used up. 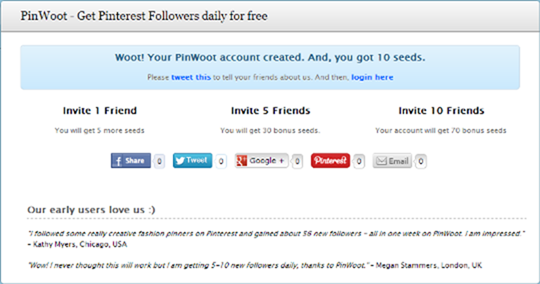 You can set the the number of seeds you want to give away to potential followers. Obviously the more you give the more followers you get! That said, there is a limitation on the number of users you can follow a day. Although you can get unlimited followers, you can follow only 20 new users a day. And, if you have a business profile or brand and want to earn followers but don’t care much about following others, you can simply buy seeds. PinWoot is still in the initial stages of development, so don’t expect a fancy dashboard and analytics to measure your social activity at this point! The PinWoot dashboard also indicates plans to bring features that let you follow users based on a specific category. A Pro account is also in the works and that will have you getting followers automatically. Overall, a pretty cool tool to use to build your Pinterest base. Since Pinterest is is a platform that continues to grow everyday, it would be wise to start growing your network right away, and what better tool to help you get started than PinWoot.